In the past week there’s been a little flurry of media coverage of Hurricane Sandy’s impact in refugee camps in Haiti. The situation is grim: Sandy caused over 50 deaths, damaged hundreds of thousands of Haitian homes, and left many more without food. New reports suggest that cholera has been on the rise in Sandy’s aftermath too—since the hurricane ravaged roads and bridges, it’s been harder than ever for Haitians to access clean water and medical resources. A bout of press coverage like this can help turn the public’s attention and hearts to Haiti, at least for a little while. But there are plenty of Haitian families, particularly in rural areas, who were living without access to medical care well before the new destruction and hardships Sandy brought on. The need for accessible healthcare in Haiti has always been an issue worthy of our attention; Sandy has only made this need more urgent and more visible. 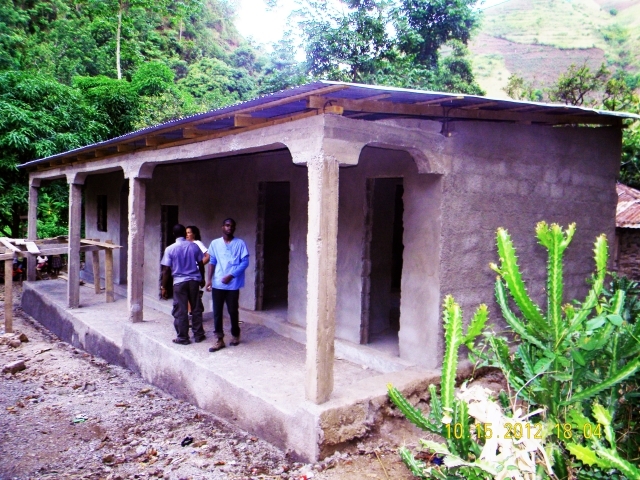 Two years ago, VHP committed to building, staffing, and supplying a medical clinic in Fiervil, Haiti that will make regular healthcare access available to residents of Chermaître and surrounding villages for the first time. We’ve made some serious strides since this project began, not the least of which was raising $23,000 for the construction of the clinic building. When Emily, Lanbo, and Lila traveled down to Haiti in October, they got to see the nearly-complete structure, which has been built thanks to the efforts local engineers and workers. Another triumph for the medical initiative has been coalescing a medical advisory board of Arlington doctors, chaired by Danny Aronzon, MD, to help oversee the running of the Chermaître-Fierviel clinic. But we still have a long way to go if we’re going to make this medical clinic a reality. That’s why this month VHP is gearing up for our biggest medical initiative fundraising event to date: the Art and Soul Reception. 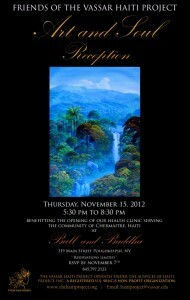 We’re inviting medical professionals and friends of VHP from all over Arlington to Poughkeepsie’s Bull & Buddha restaurant to enjoy an evening of food, cocktails, live music from Vassar jazz and a cappella ensembles, and, of course, vibrant Haitian art for sale. Proceeds from the reception will support clinic operations for the next year. Annie and her Medical Committee and all vhp leadership have done a stellar job in making this event one of the greatest vhp events ever! Thanks for all your insights, guidance and wisdom, Annie! Thank you for sharing superb informations. Your web site is very cool. I am impressed by the details that you’ve on this blog. It reveals how nicely you perceive this subject. Bookmarked this web page, will come back for more articles. You, my friend, ROCK! I found simply the information I already searched everywhere and just could not come across. What a perfect site.